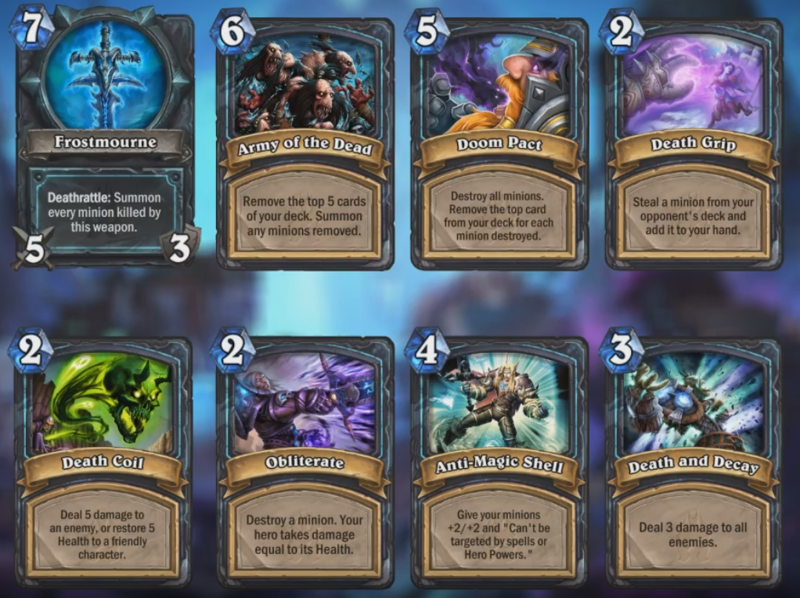 Hearthstone's newest expansion, Knights of the Frozen Throne, will take place in the frozen wastes of Northrend and feature Death Knight-inspired cards and mechanics when it arrives Aug. 10. 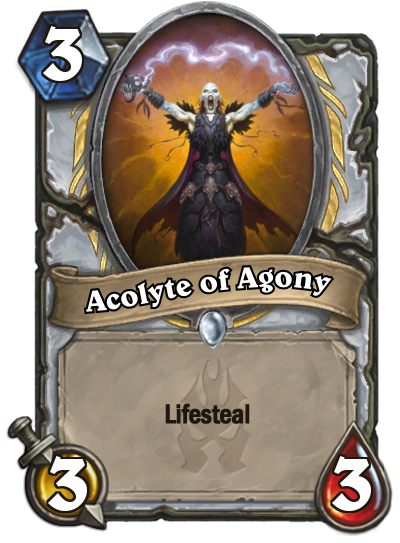 These include Hero cards which will turn the game's nine classes into Death Knights, a health-drain card effect called Lifesteal and eight free single-player missions inspired by the bosses of the Icecrown Citadel raid in World of Warcraft. 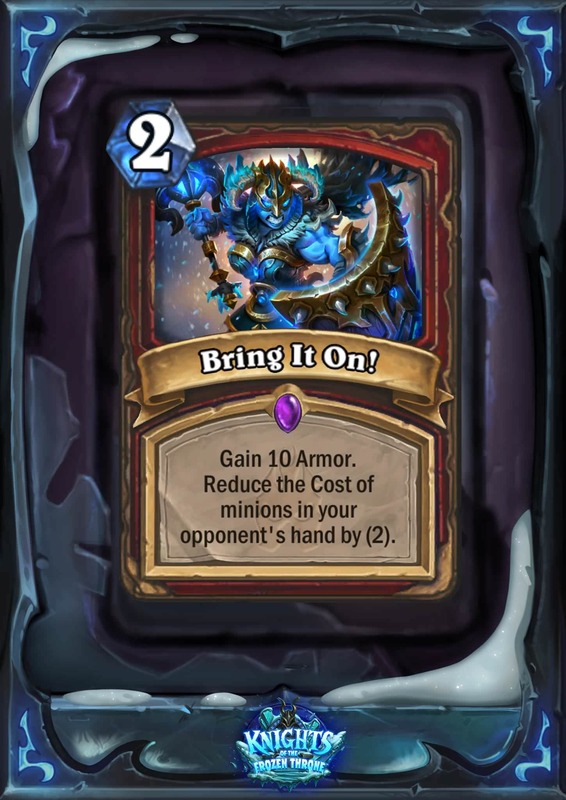 A new card type similar to Lord Jaraxxus and Majordomo Executus' deathrattle, Hero cards will feature a Battlecry and give you armor in addition to changing your hero's portrait and giving them a new Hero Power. 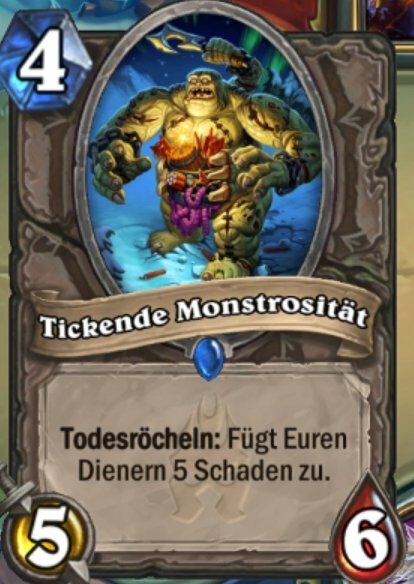 For instance, Darkstalker Rexxar will change the Hunter's Hero Power to "Craft a custom Zombeast" which will let you Discover two Beast cards and combine them. 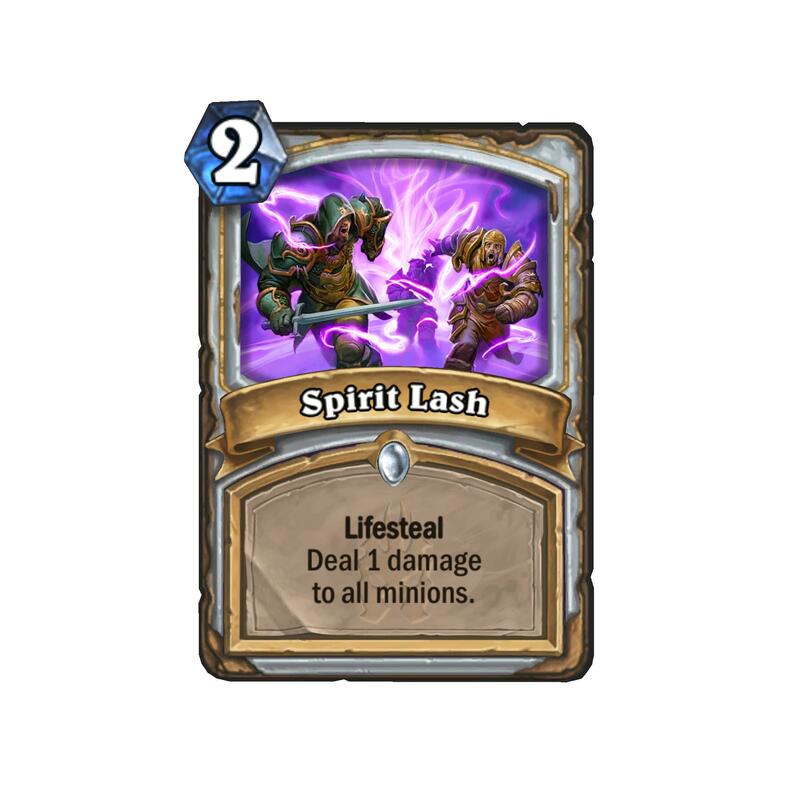 Similar to Magic: the Gathering's Lifelink attribute, Hearthstone cards with the keyword "Lifesteal" will convert the damage they do to enemy heroes and minions to health for you. 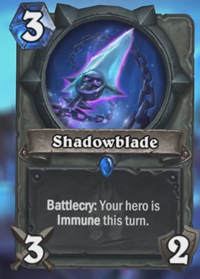 According to Hearthstone game director Ben Brode in the expansion's announcement video, Deathrattle cards will also be prominent. While Blizzard will no longer be making full Adventure sets, single-player missions are returning to Hearthstone with Knights of the Frozen Throne with eight encounters featuring bosses from the Icecrown Citadel raid including Lord Marrowgar, Sindragosa and the Lich King himself. 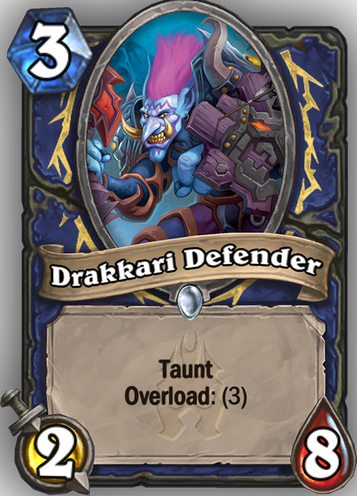 After completing the first mission, players will receive a Legendary Death Knight Hero card. Finishing all the missions will then score you three free packs. Players who defeat the Lich King once with all nine classes will receive Prince Arthas Menethil, an alternate hero for the Paladin class. The Lich King: 8 Mana Neutral Legendary, 8/8. Taunt. At the end of your turn, add a random Death Knight card to your hand. Arfus: 4 Mana Neutral Legendary, 2/2. 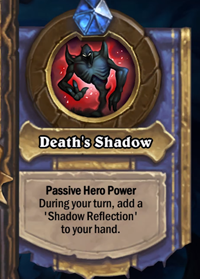 Deathrattle: Add a random Death Knight card to your hand. Scourgelord Garrosh: 8 Mana Warrior Hero, 5 Armor. 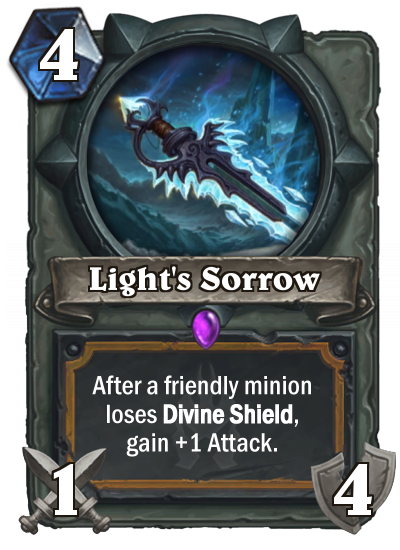 Battlecry: Equip a 4/3 Shadowmourne that also damages adjacent minions. Hero Power: Bladestorm: Deal 1 damage to all minions. 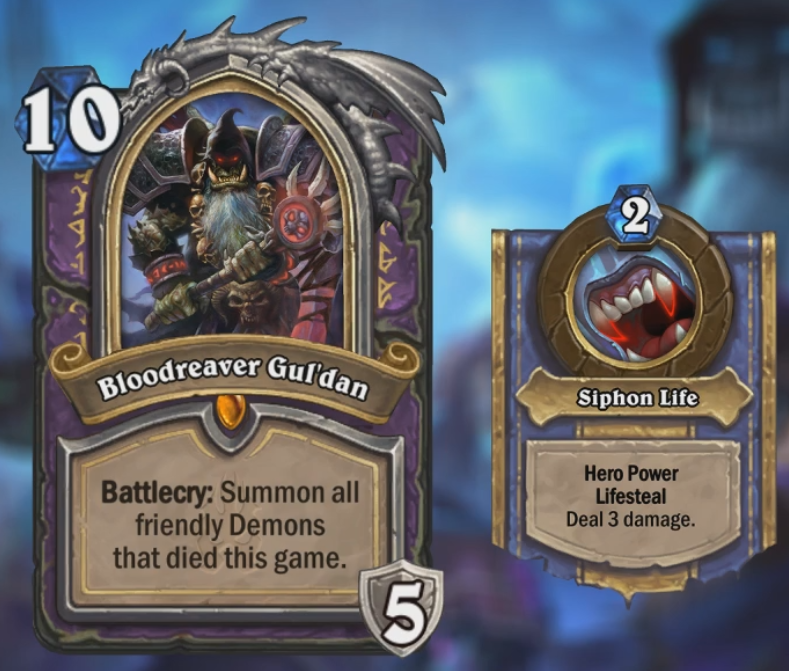 Bloodreaver Gul'dan: 10 Mana Warlock Hero, 5 Armor. Battlecry: Summon all friendly Demons that died this game. Hero Power: Siphon Life: Lifesteal. Deal 3 damage. 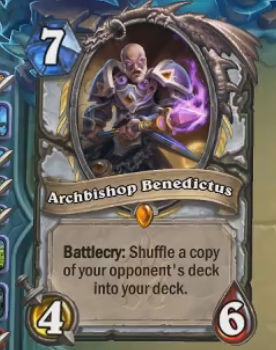 Archbishop Benedictus 7 4/6 Battlecry: Shuffle a copy of your opponent's deck into your deck. 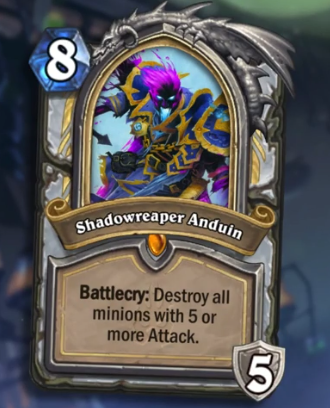 Shadowreaper Anduin 8 5 Armor Battlecry: Destroy all minions with 5 or more Attack. 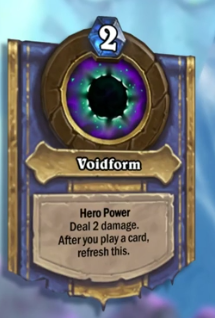 Change your hero power to Voidform: Deal 2 damage. After you play a card refresh this. 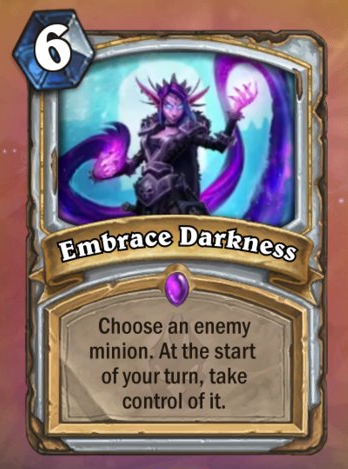 Embrace Darkness 6 Spell Choose an enemy minion. At the start of your turn take control of it. Obsidian Destroyer 9 4/8 Taunt. 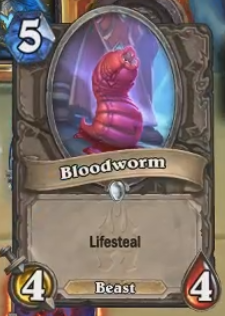 Lifesteal. Deathrattle: Destroy a random enemy minion. 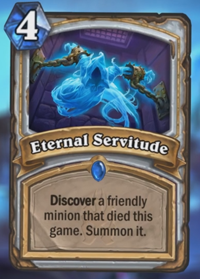 Eternal Servitude 4 Spell Discover a friendly minion that died this game. Summon it. 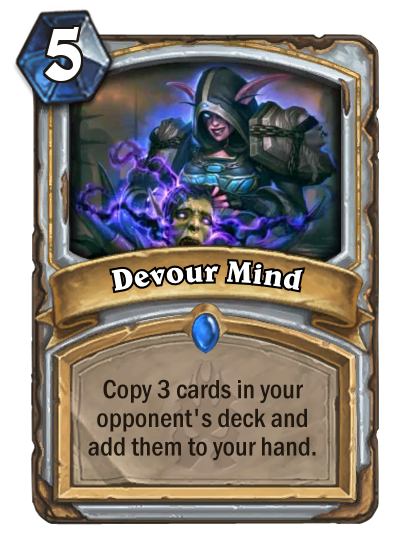 Devour Mind 5 Spell Copy 3 cards in your opponent's deck and add them to your hand. 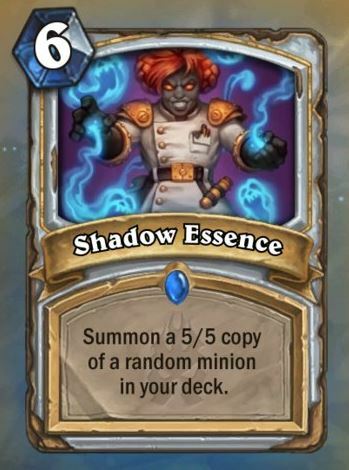 Shadow Essence 6 Spell Summon a 5/5 copy of a random minion in your deck. Hadronox 9 3/7 Deathrattle: Summon your Taunt minions that died this game. 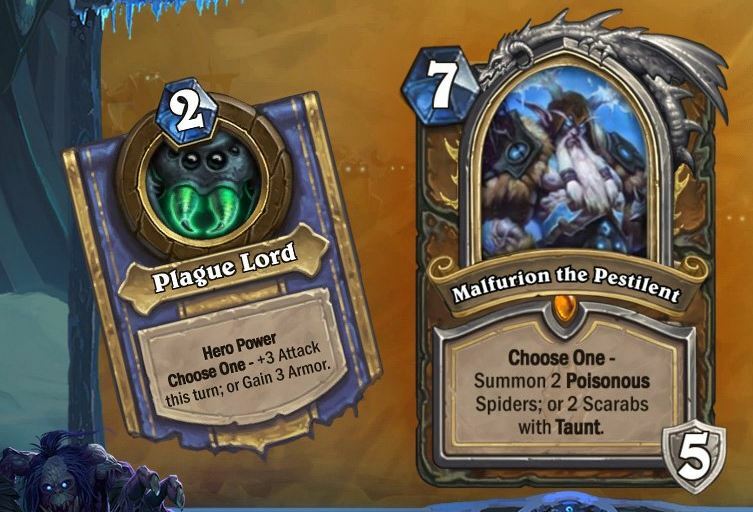 Malfurion the Pestilent 7 5 Armor Choose One - Summon 2 Poisonous Spiders; or 2 Scarabs with Taunt. Plague Lord: Hero Power: Choose One - +3 Attack this turn; or Gain 3 Armor. 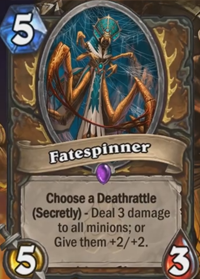 Fatespinner 5 5/3 Choose a Deathrattle (secretly): Deal 3 damage to all minions or give them +2/+2. 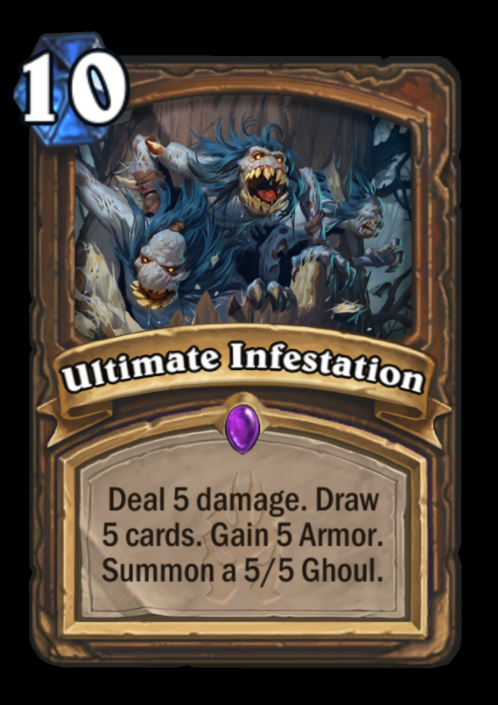 Ultimate Infestation 10 Spell Deal 5 damage. Draw 5 cards. Gain 5 Armor. 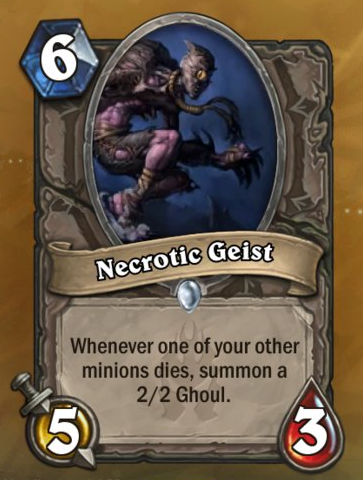 Summon a 5/5 Ghoul. 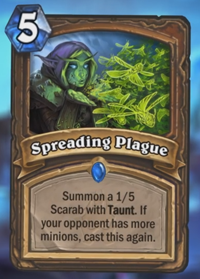 Spreading Plague 5 Spell Summon a 1/5 Scarab with Taunt. 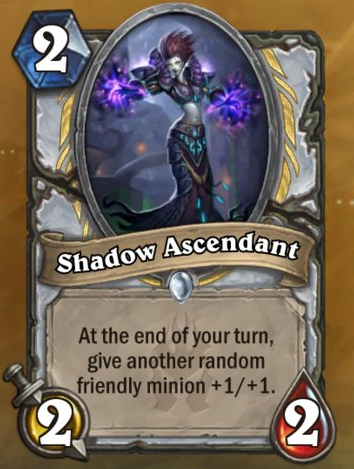 If your opponent has more minions cast this again. 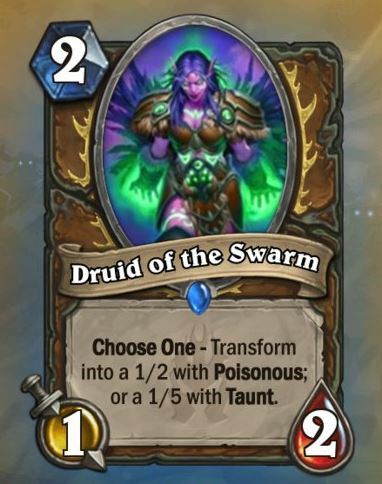 Druid of the Swarm 2 1/2 Choose One - Transform into a 1/2 with Poisonous; or a 1/5 with Taunt. 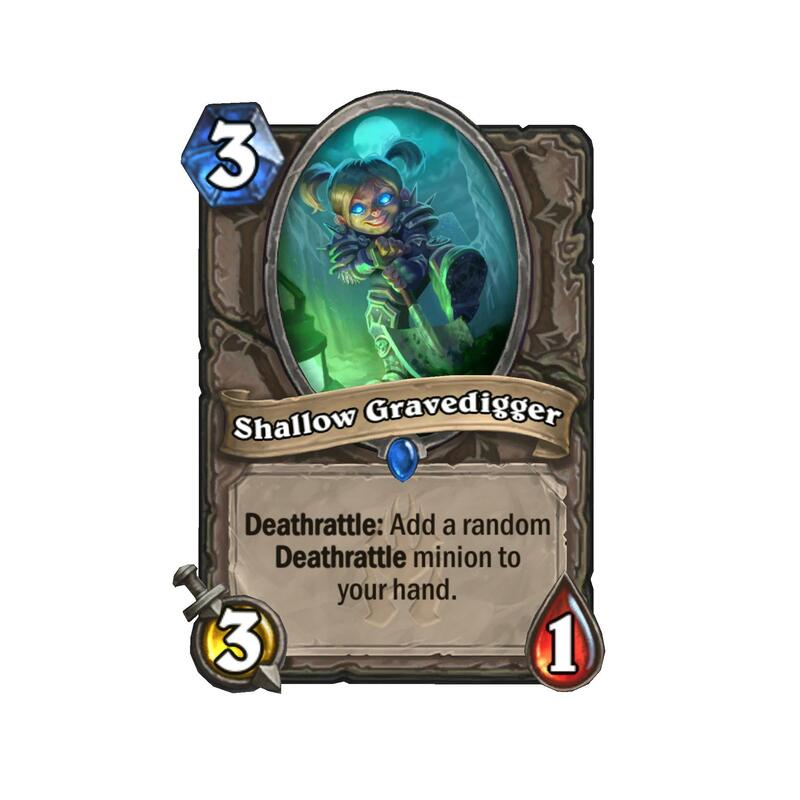 Strongshell Scavenger 4 2/3 Battlecry: Give your Taunt minions +2/+2. Crypt Lord 3 1/6 Taunt. After you a summon a minion gain +1 Health. 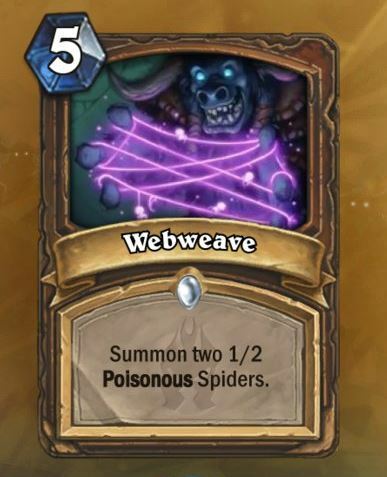 Webweave 5 Spell Summon two 1/2 Poisonous Spiders. 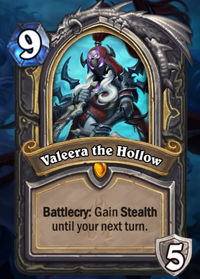 Valeera the Hollow 9 5 Armor Battlecry: Gain Stealth until your next turn. Hero Power: Passive Hero Power. During your turn add a Shadow Reflection to your hand. 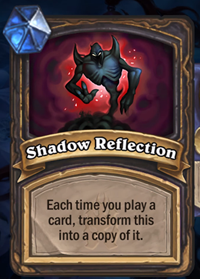 Shadow Reflection: Each time you play a card transform this into a copy of it. 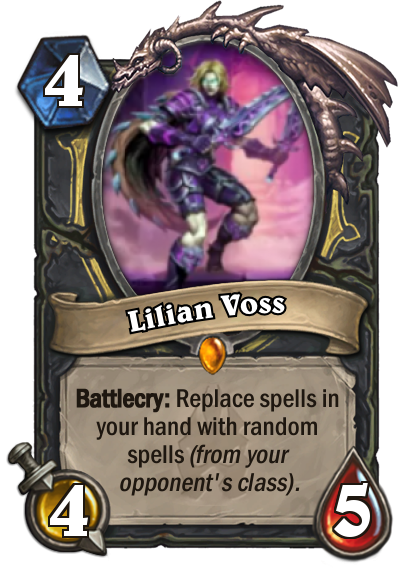 Lilian Voss 4 4/5 Battlecry: Replace spells in your hand with random spells (from your opponent's class). 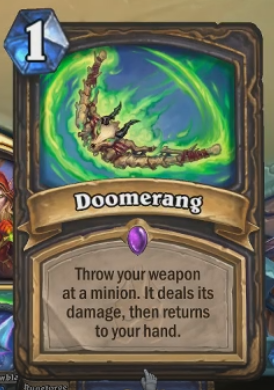 Doomerang 1 Spell Throw your weapon at a minion. It deals its damage then returns to your hand. 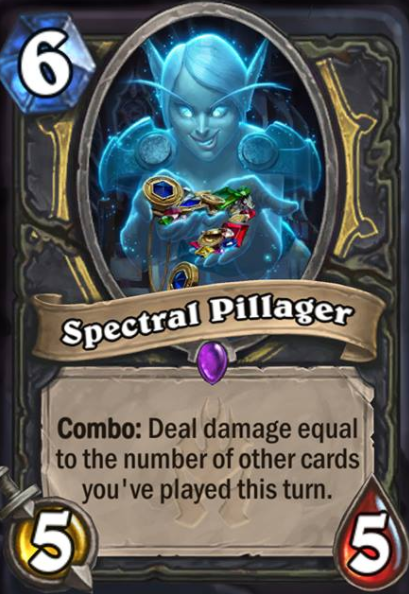 Spectral Pillager 6 5/5 Combo: Deal damage equal to the number of other cards you've played this turn. 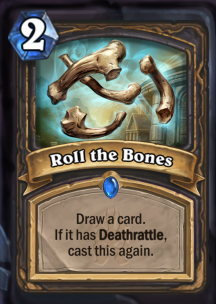 Roll the Bones 2 Spell Draw a card. 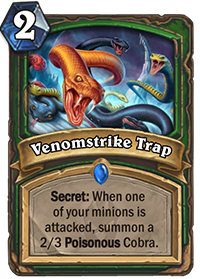 If it has Deathrattle cast this again. 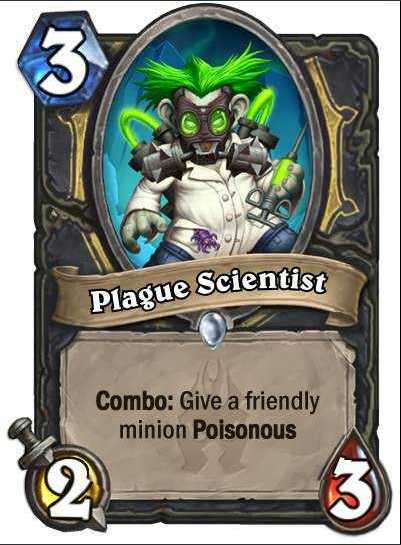 Plague Scientist 3 2/3 Combo: Give a friendly minion Poisonous. 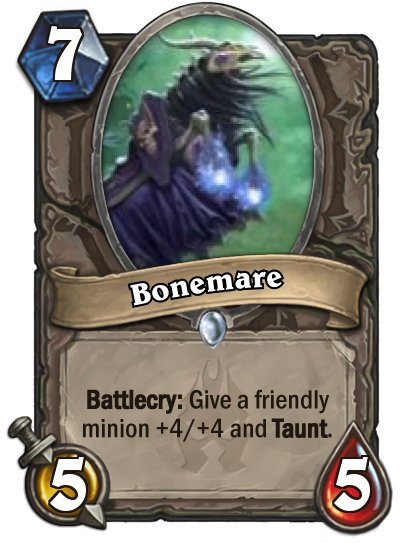 Bone Baron 5 5/5 Deathrattle: Add two 1/1 Skeletons to your hand. 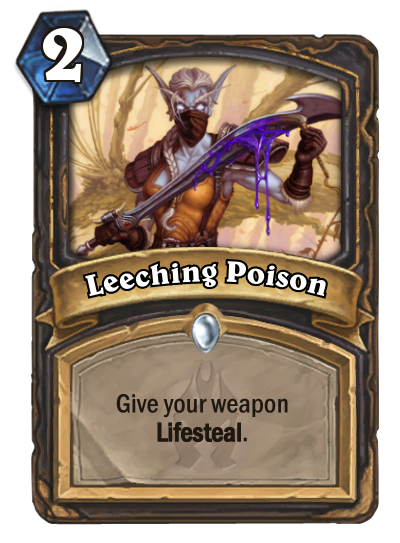 Leeching Poison 2 Spell Give your weapon Lifesteal. 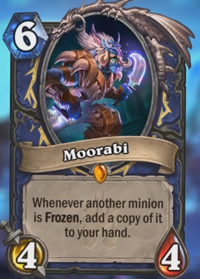 Moorabi 6 4/4 Whenever another minion is Frozen add a copy of it to your hand. 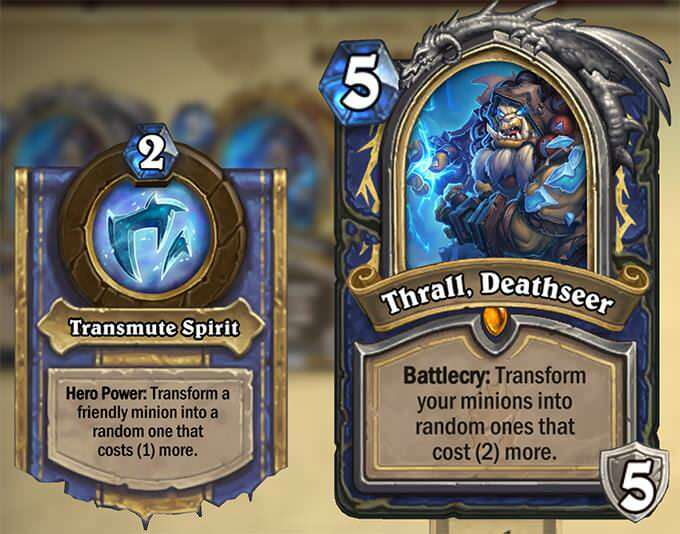 Thrall Deathseer 5 5 Armor Battlecry: Transform your minions into random ones that cost (2) more. Hero Power: Transmute Spirit: Transform a friendly minion into a random one that costs (1) more. 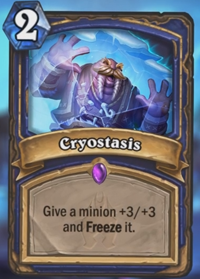 Cryostasis 2 Spell Give a minion +3/+3 and Freeze it. 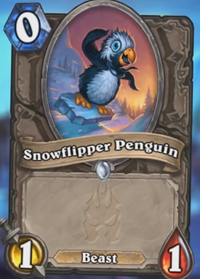 Snowfury Giant 11 8/8 Costs (1) less for each Mana Crystal you've Overloaded this game. 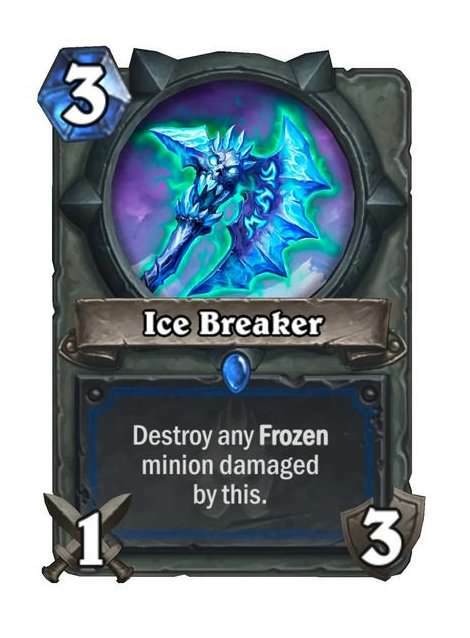 Ice Breaker 3 1/3 Destroy any Frozen minion damaged by this. Voodoo Hexxer 5 2/7 Taunt. 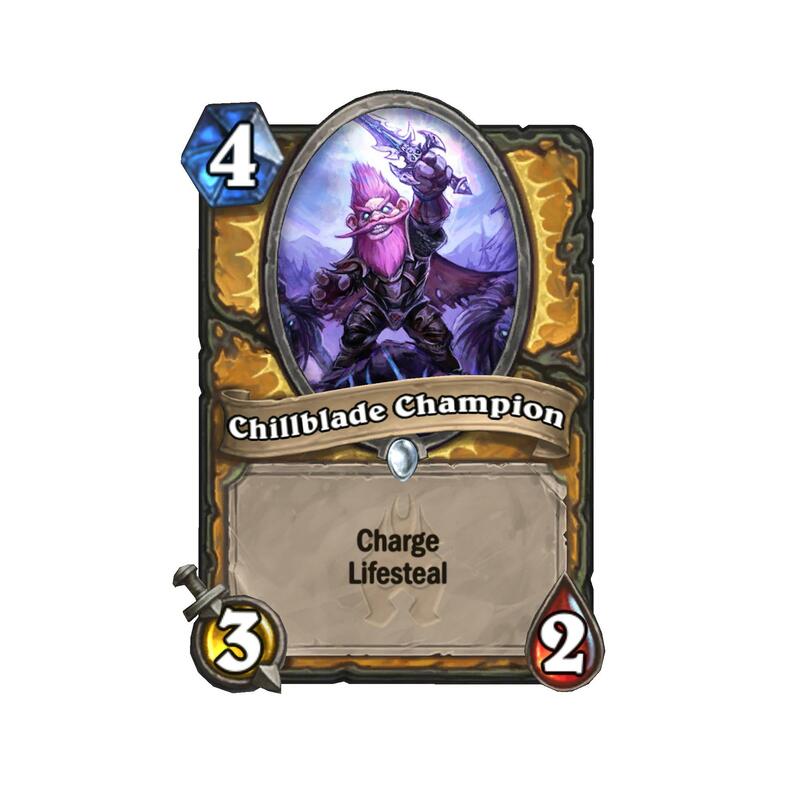 Freeze any character damaged by this minion. 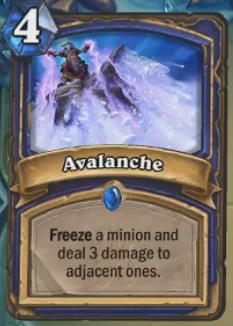 Avalanche 4 Spell Freeze a minion and deal 3 damage to adjacent ones. Brrrloc 2 2/2 Battlecry: Freeze an enemy. 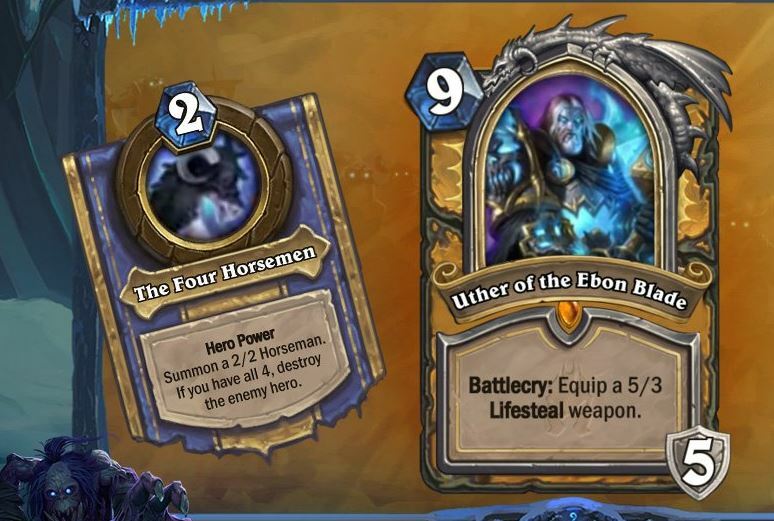 Uther of the Ebon Blade 9 5 Armor Battlecry: Equip a 5/3 Lifesteal weapon. Hero Power: The Four Horsemen: Summon a 2/2 Horseman. If you have all 4 destroy the enemy hero. 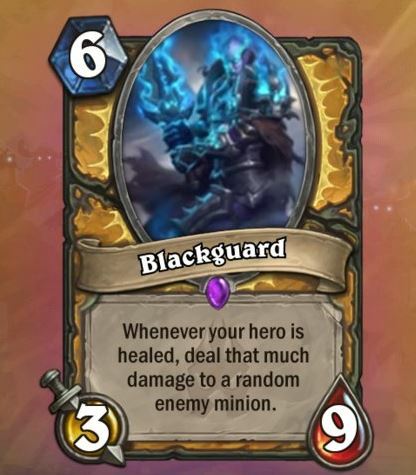 Blackguard 6 3/9 Whenever your hero is healed deal that much damage to a random enemy minion. 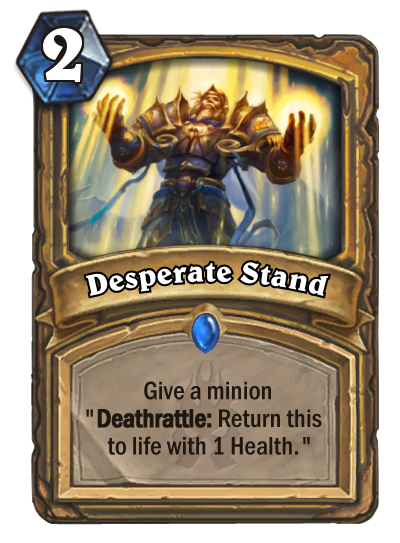 Desperate Stand 2 Spell Give a minion "Deathrattle: Return this to life with 1 Health." 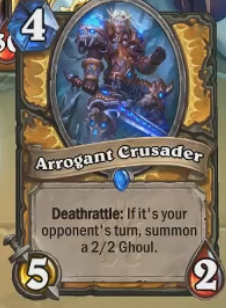 Arrogant Crusader 4 5/2 Deathrattle: If it's your opponent's turn summon a 2/2 Ghoul. 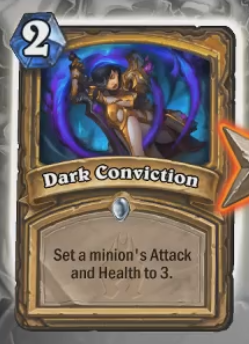 Dark Conviction 2 Spell Set a minion's Attack and Health to 3. 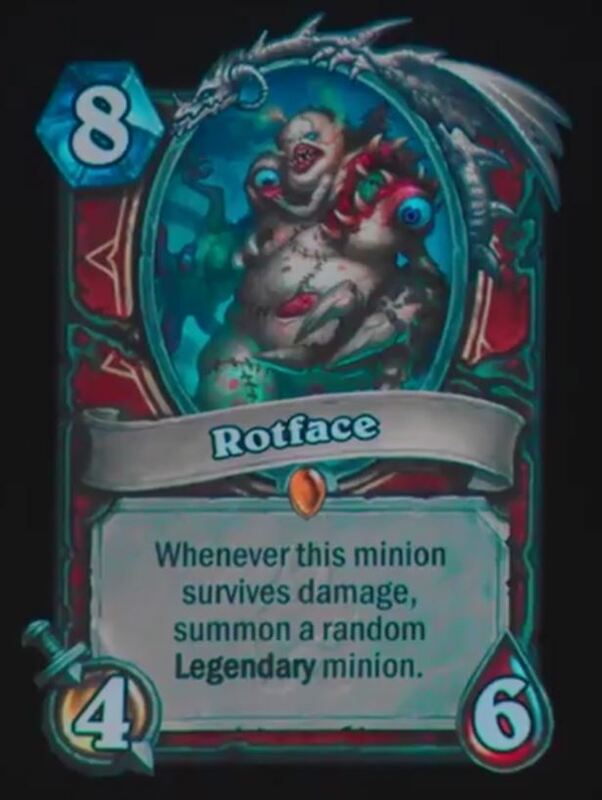 Rotface 8 4/6 Whenver this minion survives damage summon a random Legendary minion. 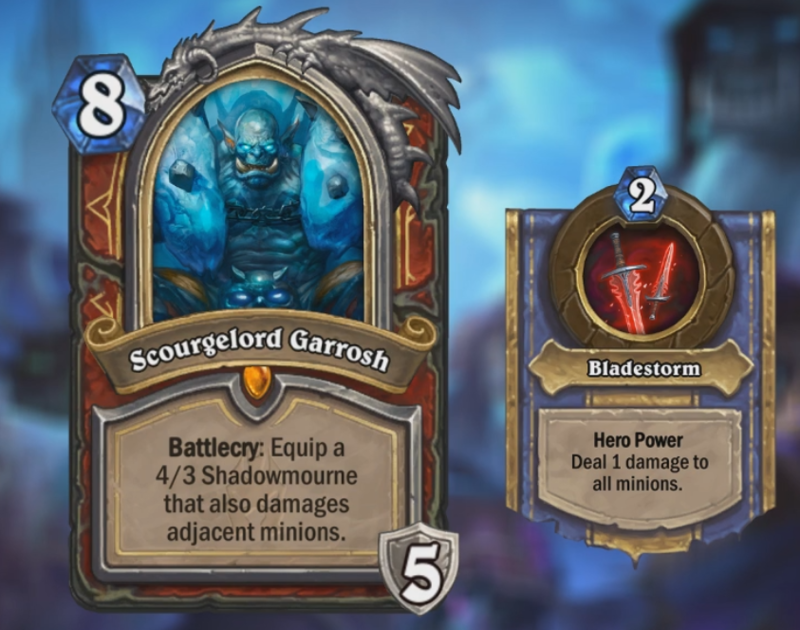 Scourgelord Garrosh 8 5 Armor Battlecry: Equip a 4/3 Shadowmourne that also damages adjacent minions. Bring It On! 2 Spell Gain 10 Armor. 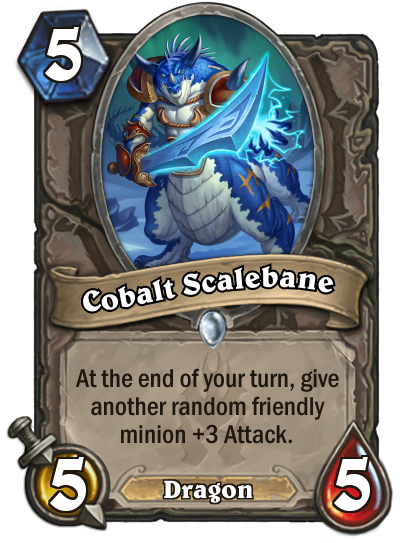 Reduce the Cost of minions in your opponent's hand by (2). 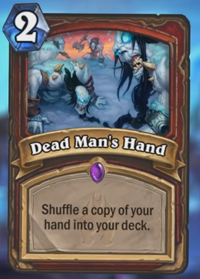 Dead Man's Hand 2 Spell Shuffle a copy of your hand into your deck. 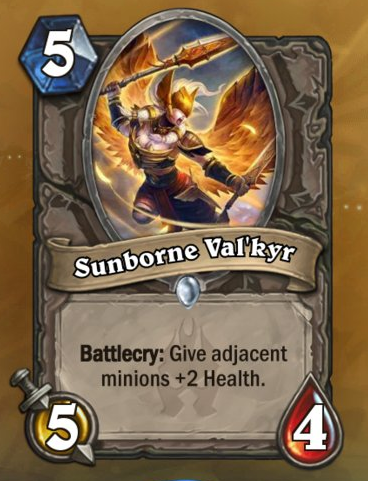 Mountainfire Armor 3 4/3 Deathrattle: If it's your opponent's turn gain 6 Armor. 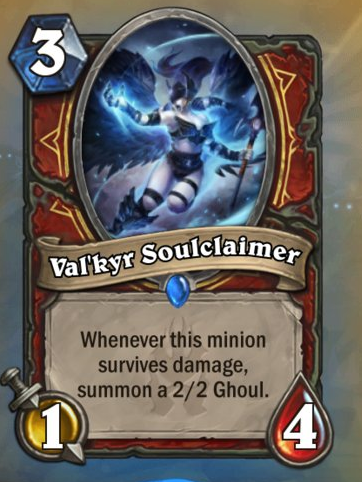 Val'kyr Soulclaimer 3 1/4 Whenever this minion survives damage summon a 2/2 ghoul. 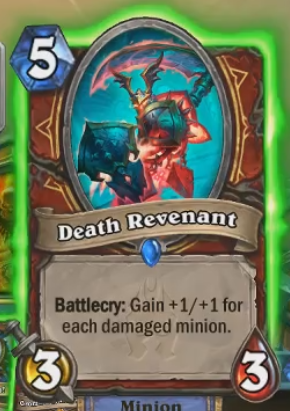 Death Revenant 5 3/3 Battlecry: Gain +1/+1 for each damaged minion. 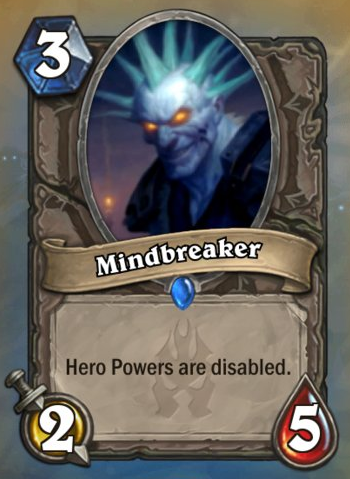 Animated Berserker 1 1/3 After you play a Minion deal 1 damage to it. 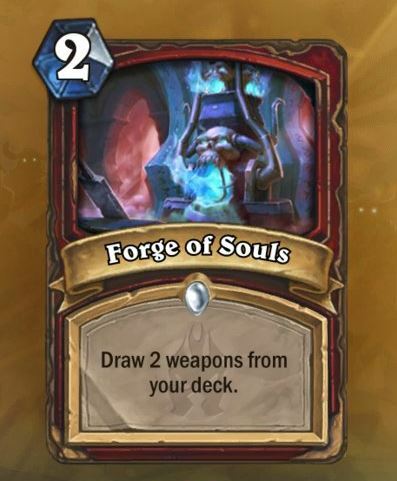 Forge of Souls 2 Spell Draw 2 weapons from your deck. 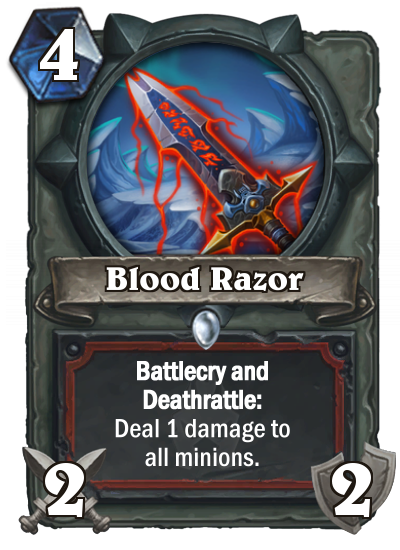 Blood Razor 4 2/2 Weapon Battlecry and Deathrattle: Deal 1 damage to all minions. Bloodreaver Gul'dan 10 5 Armor Battlecry: Summon all friendly Demons that dies this game. 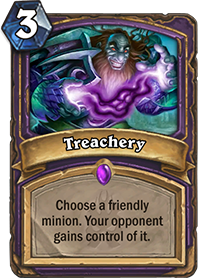 Treachery 3 Spell Choose a friendly minion. Your opponent gains control of it. 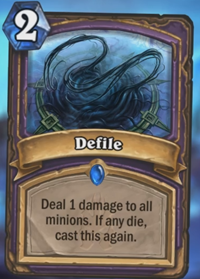 Defile 2 Spell Deal 1 damage to all minions. If any die cast this again. Unwilling Sacrifice 3 Spell Choose a friendly minion. 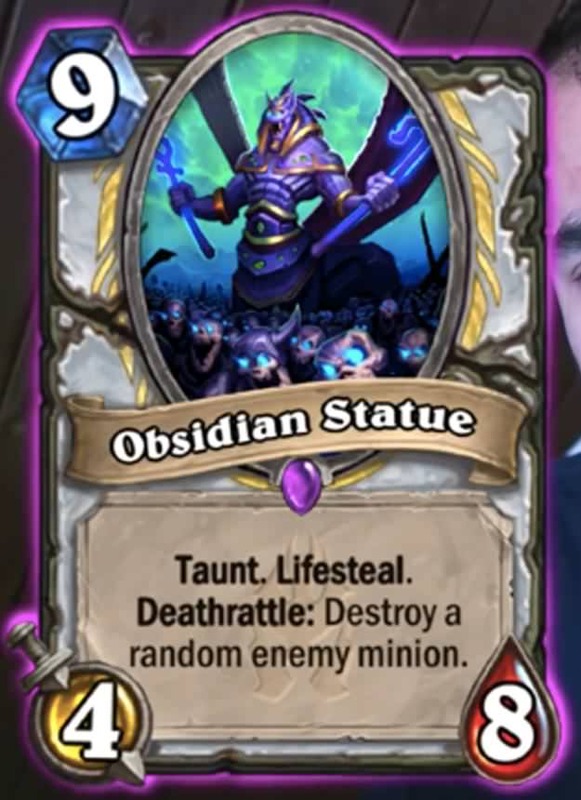 Destroy it and a random enemy minion. 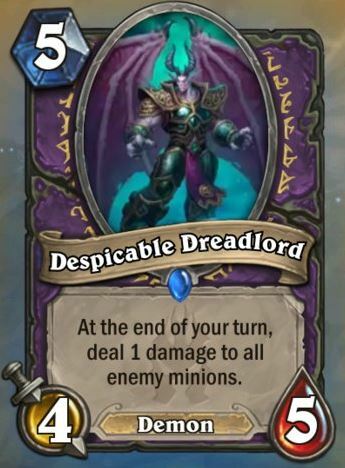 Despicable Dreadlord 5 4/5 At the end of your turn deal 1 damage to all enemy minions. Sanguine Reveler 1 1/1 Battlecry: Destroy friendly minion and gain +2/+2. 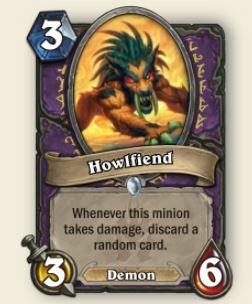 Howlfiend 3 3/6 Whenever this minion takes damage discard a card. 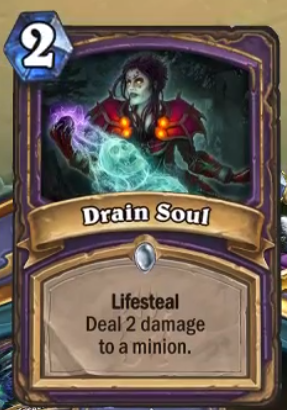 Drain Soul 2 Spell Lifesteal. Deal 2 damage to a minion. 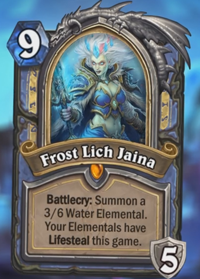 Frost Lich Jaina 9 5 Armor Battlecry: Summon a 3/6 Water Elemental. Your Elementals have Lifesteal this game. Hero Power: Icy Touch: Deal 1 damage. 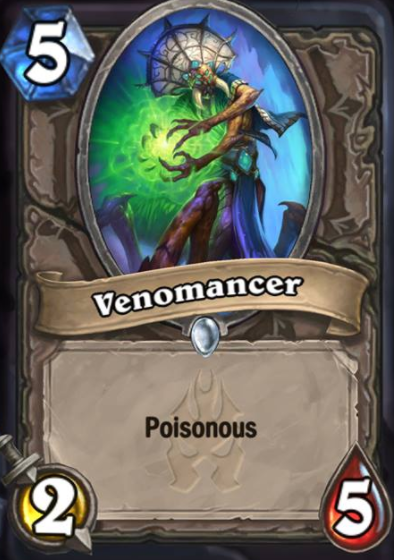 If this kills a minion summon a Water Elemental. 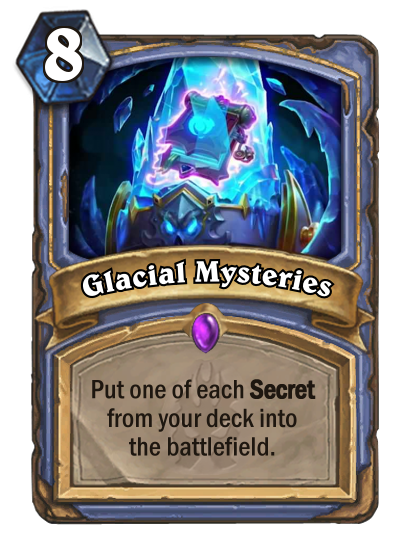 Glacial Mysteries 8 Spell Put one of each Secret from your deck into the battlefield. 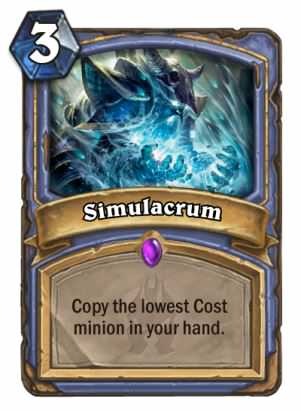 Simulcrum 3 Spell Copy the lowest Cost minion in your hand. Ghastly Conjurer 4 2/6 Battlecry: Add a 'Mirror Image' spell to your hand. 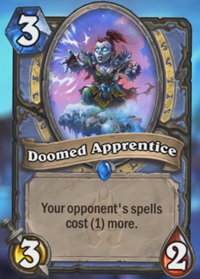 Doomed Apprentice 3 3/2 Your opponent's spells cost (1) more. 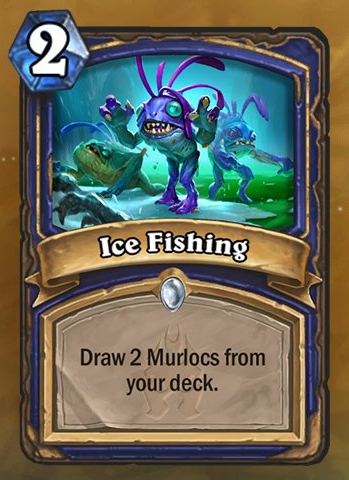 Ice Walker 2 1/3 Your Hero Power also Freezes the target. 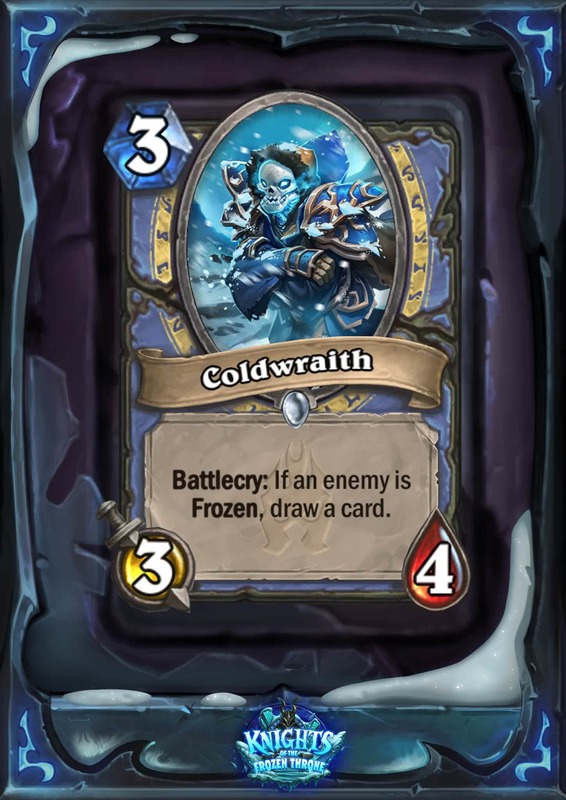 Coldwraith 3 3/4 Battlecry: If an enemy is Frozen draw a card. 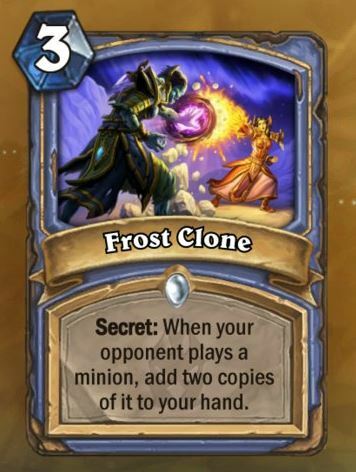 Frost Clone 3 Spell Secret: When your opponent plays a minion add two copies of it to your hand. 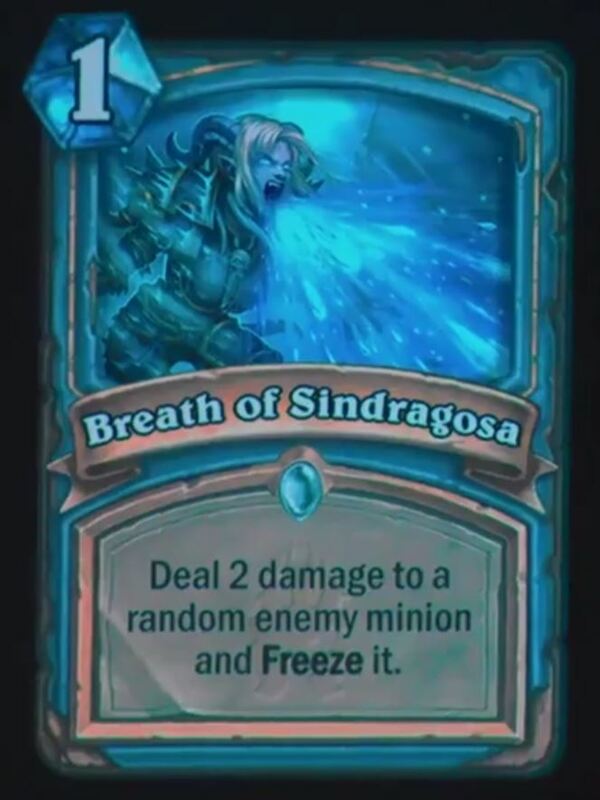 Breath of Sindragosa 1 Spell Deal 2 damage to a random enemy minion and Freeze it. 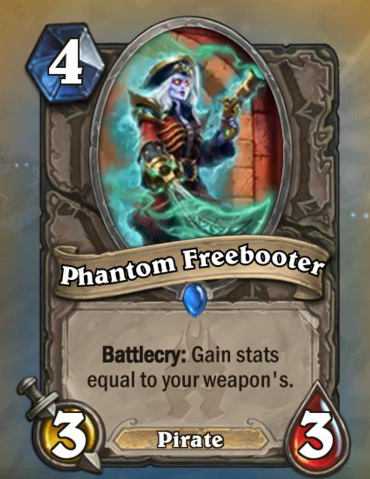 Abominable Bowman 7 6/7 Deathrattle: Summon a random friendly Beast that died this game. 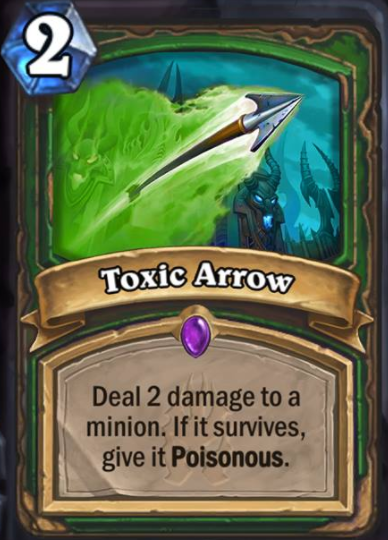 Toxic Arrow 2 Spell Deal 2 damage to a minion. If it survives git it Poisonous. 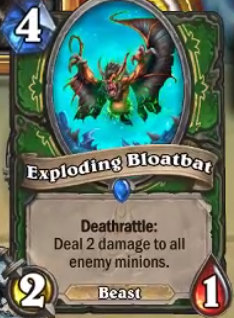 Exploding Bloatbat 4 2/1 Deathrattle: Deal 2 damage to all enemy minions. Bearshark 3 4/3 Can't be targeted by spells or Hero Powers. 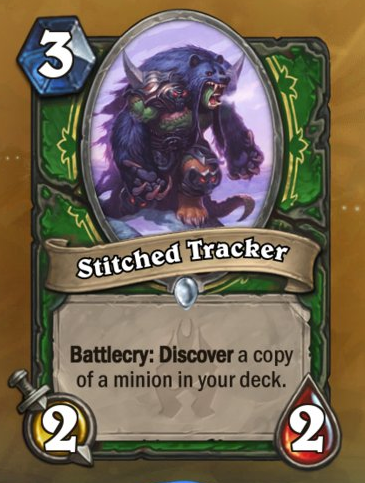 Stitched Tracker 3 2/2 Battlecry: Discover a copy of a minion in your deck. 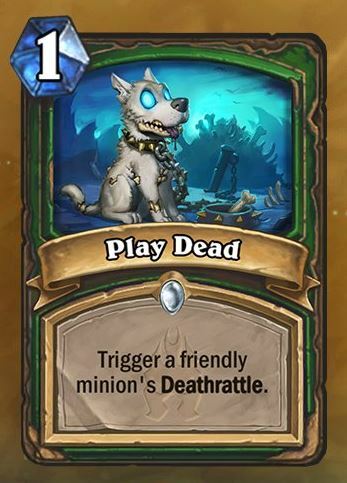 Play Dead 1 Spell Trigger a friendly minion's Deathrattle. 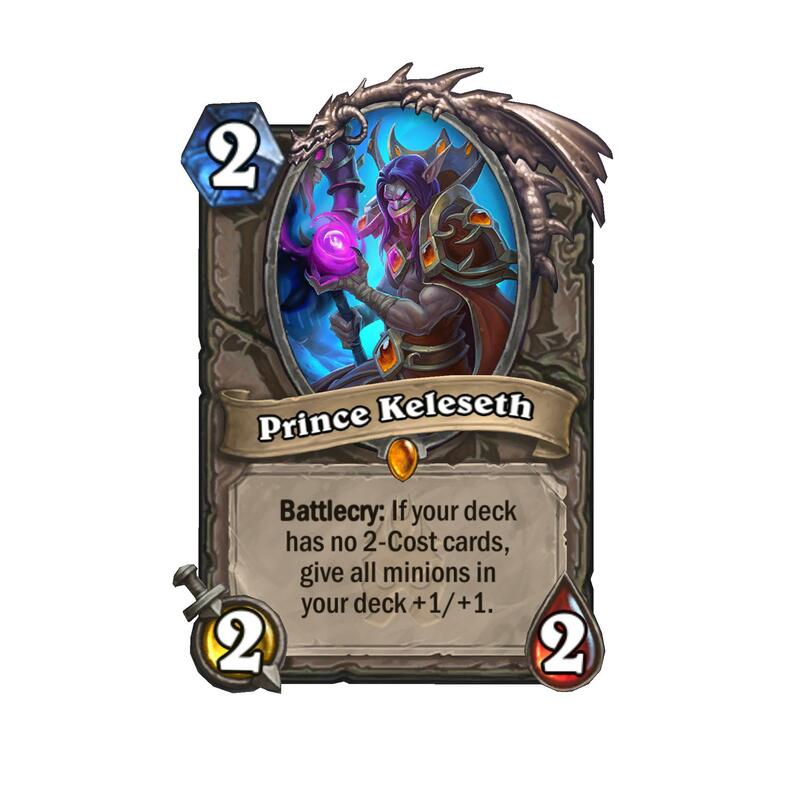 Prince Keleseth 2 2/2 Battlecry: If your deck has no 2-cost cards give all minions in your deck +1/+1. 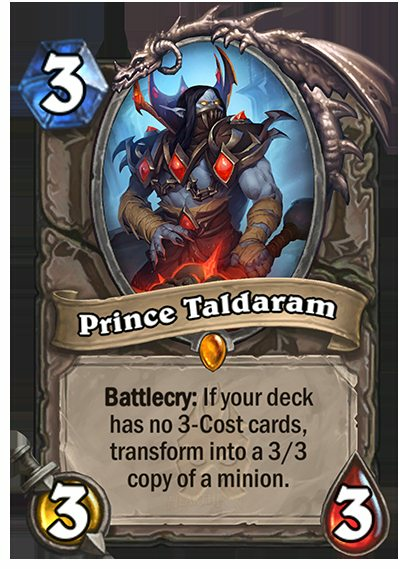 Prince Taldaram 3 3/3 Battlecry: If your deck has no 3-cost cards transform into a 3/3 copy of a minion. 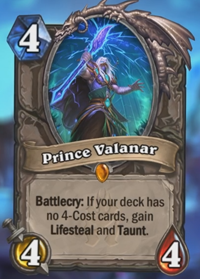 Prince Valanar 4 4/4 Battlecry: If your deck has no 4-Cost cards gain Lifesteal and Taunt. 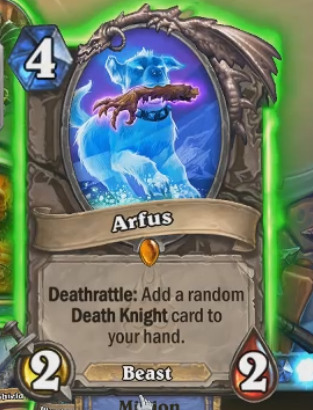 Arfus 4 2/2 Deathrattle: Add a random Death Knight card to your hand. 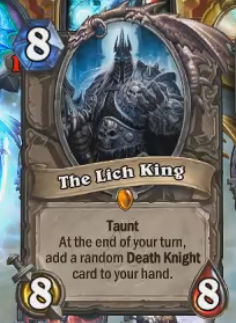 The Lich King 8 8/8 Taunt: At the end of your turn add a random Death Knight card to your hand. 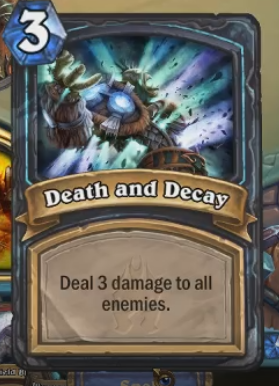 Death and Decay 3 Spell Deal 3 damage to all enemies. 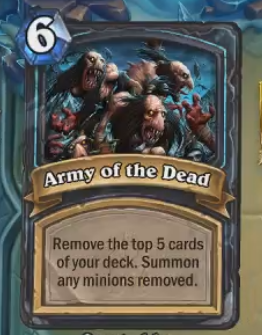 Army of the Dead 6 Spell Remove the top 5 cards from your deck. 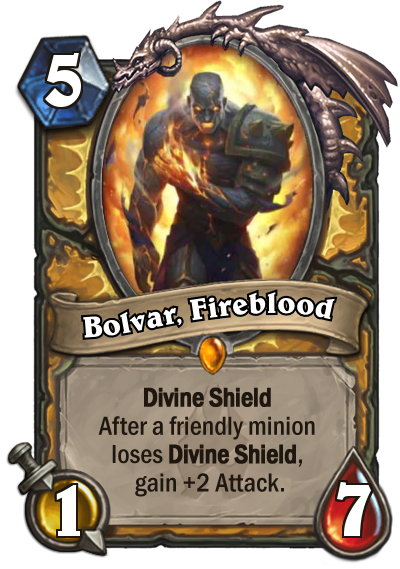 Summon any minions removed. 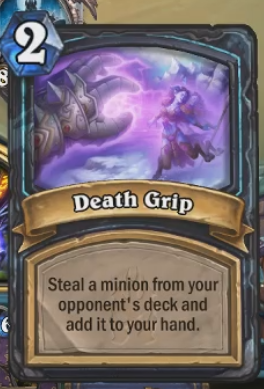 Death Grip 2 Spell Steal a minion from your opponent's deck and add it to your hand. 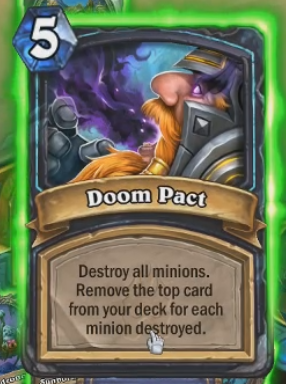 Doom Pact 5 Spell Destroy all minions. 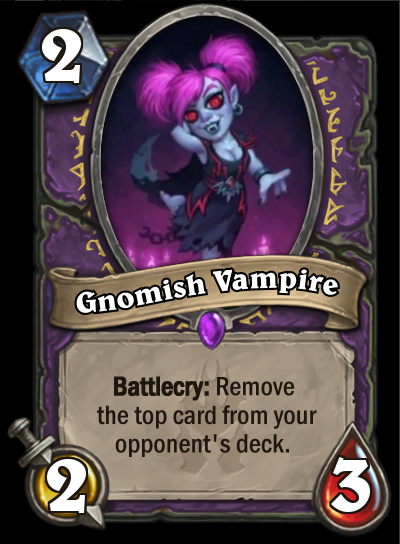 Remove the top card from your deck for each minion destroyed. 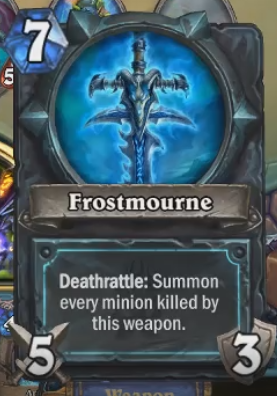 Frostmourne 7 5/3 Weapon Deathrattle: Summon every minion killed by this weapon. 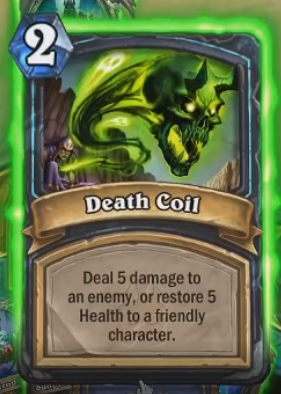 Death Coil 2 Spell Deal 5 damage to an enemy or restore 5 Health to a friendly character. 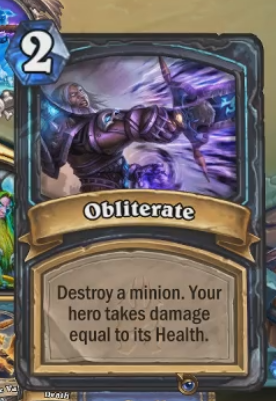 Obliterate 2 Spell Destroy a minion. Your hero takes damage equal to its Health. 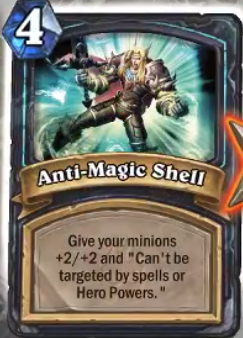 Anti-Magic Shell 4 Spell Give your minions +2/+2 and "Can't be targeted by spells or Hero Powers." 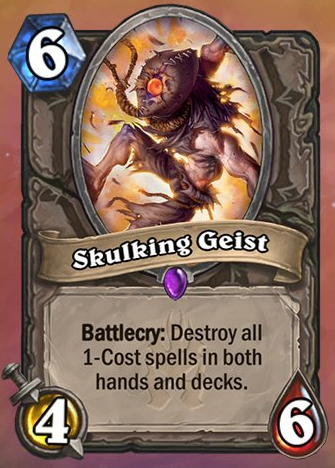 Skulking Geist 6 4/6 Battlecry: Destroy all 1-Cost spells in both hands and decks. 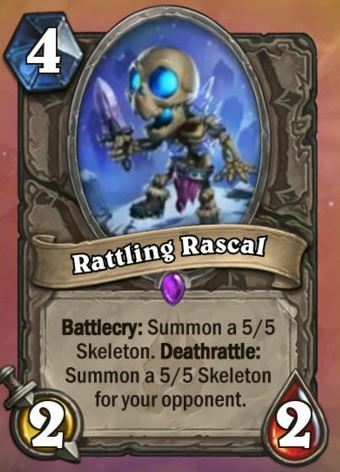 Rattling Rascal 4 2/2 Battlecry: Summon a 5/5 Skeleton. Deathrattle: Summon a 5/5 Skeleton for your opponent. 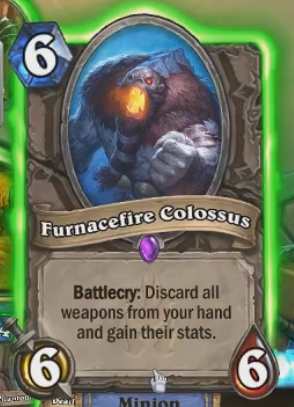 Furnacefire Colossus 6 6/6 Battlecry: Discard all weapons from your hand and gain their stats. 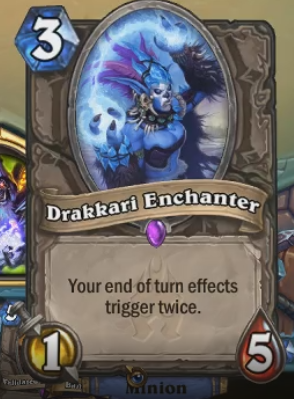 Drakkari Enchanter 3 1/5 Your end of turn effects trigger twice. 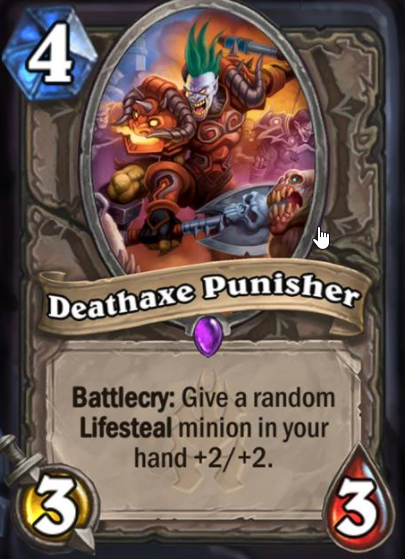 Deathaxe Punisher 4 3/3 Battlecry: Give a random Lifesteal minion in your hand +2/+2. 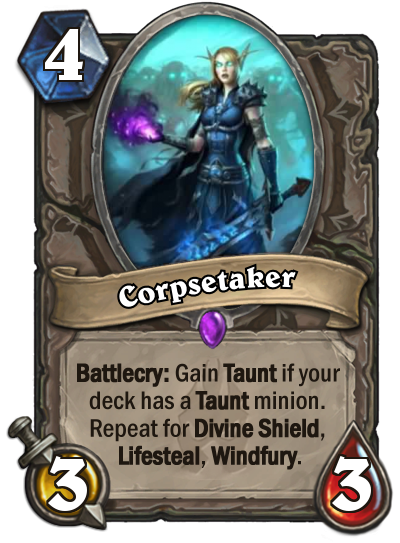 Corpse Raiser 5 3/3 Battlecry: Give a friendly minion "Deathrattle: Resummon this minion." 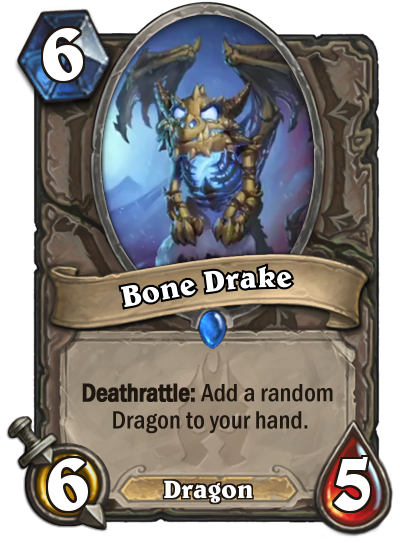 Bone Drake 6 6/5 Deathrattle: Add a random Dragon to your hand. 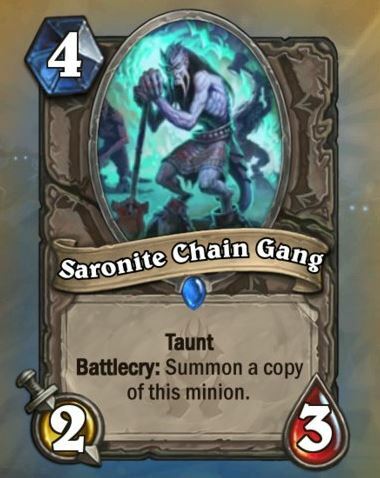 Saronite Chain Gang 4 2/3 Taunt Battlecry: Summon a copy of this minion. 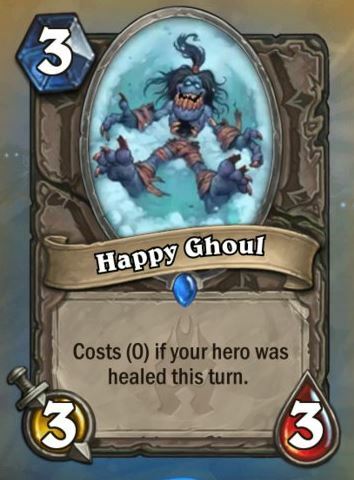 Happy Ghoul 3 3/3 Costs (0) if your hero was healed this turn. 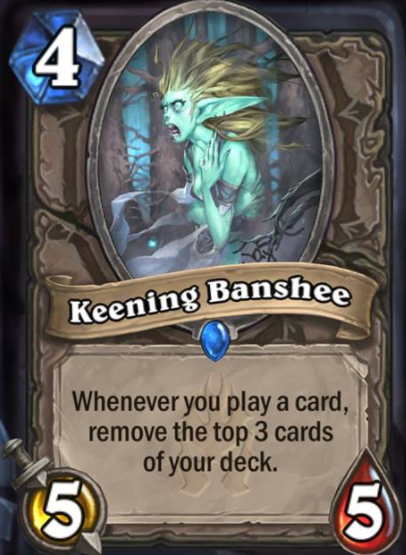 Keening Banshee 4 5/5 Whenever you play a card remove the top 3 cards of your deck. 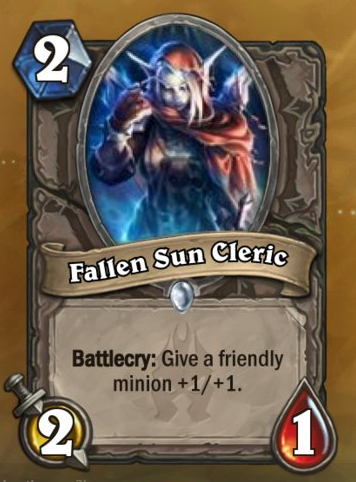 Fallen Sun Cleric 2 2/1 Battlecry: Give a friendly minion +1/+1. 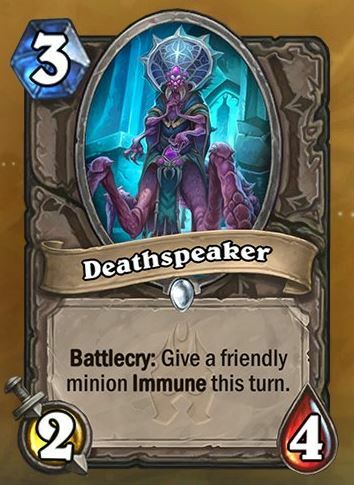 Deathspeaker 3 2/4 Battlecry: Give a friendly minion Immune this turn. 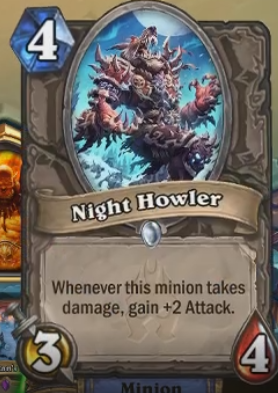 Night Howler 4 3/4 Whenever this minion takes damage gain +2 Attack. 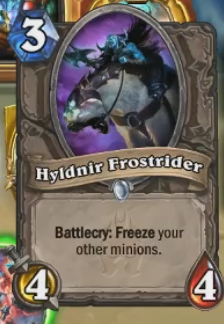 Hyldnir Frostrider 3 4/4 Battlecry: Freeze your other minions. Deadscale Knight 1 1/1 Lifesteal. 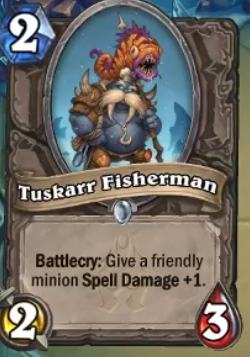 Tuskarr Fisherman 2 2/3 Battlecry: Give a friendly minion Spell Damage +1. 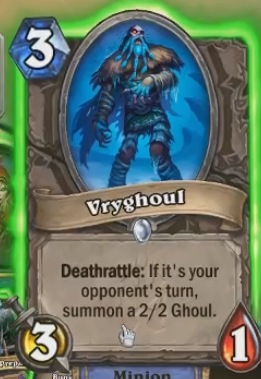 Vryghoul 3 3/1 Deathrattle: If it's your opponent's turn summon a 2/2 Ghoul. Spellweaver 6 4/4 Spell Damage +2. 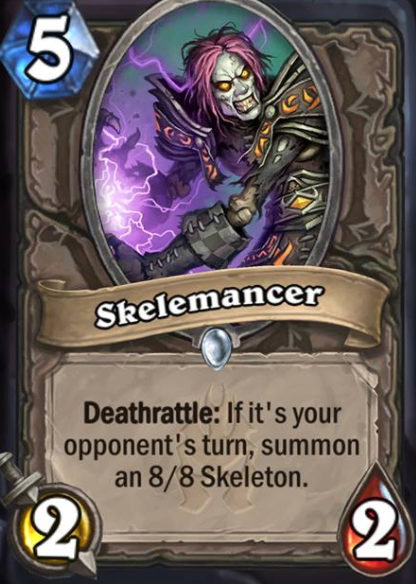 Skelemancer 5 2/2 Deathrattle: If it's your opponents turn summon an 8/8 Skeleton. 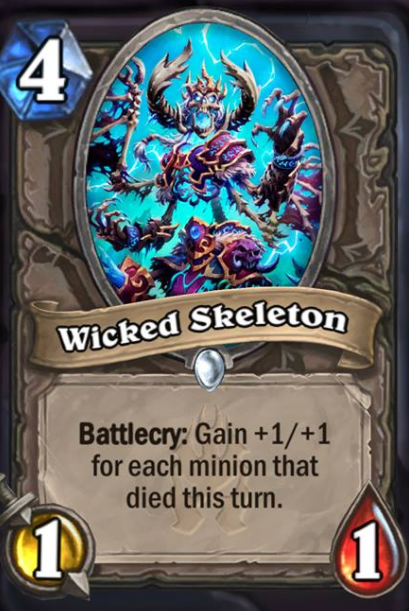 Wicked Skeleton 4 1/1 Battlecry: Fain +1/+1 for each minion that died this turn. 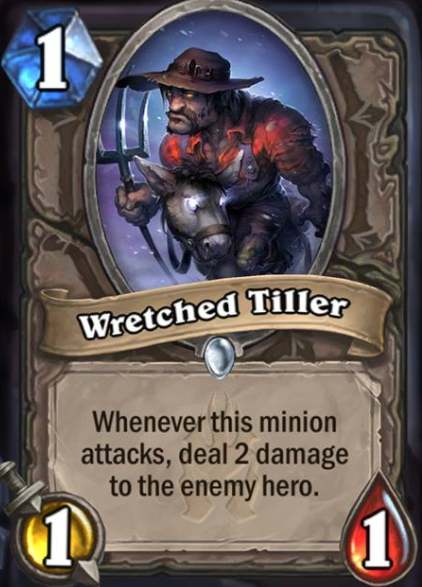 Wretched Tiller 1 1/1 Whenever this minion attacks deal 2 damage to the enemy hero. 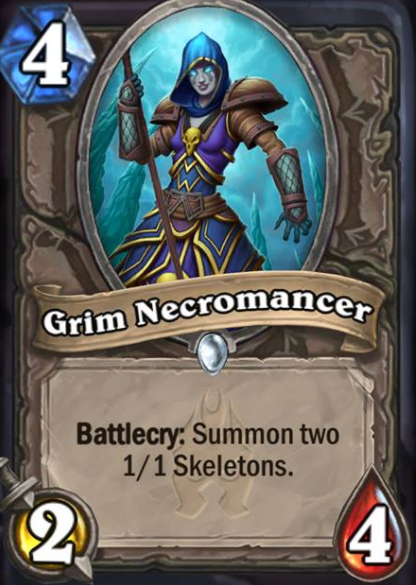 Grim Necromancer 4 2/4 Battlecry: Summon two 1/1 Skeletons. 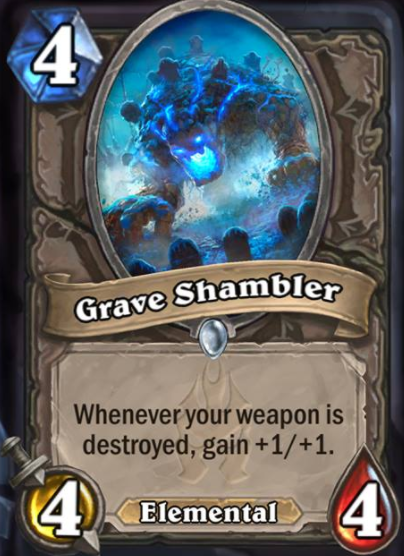 Grave Shambler 4 4/4 Whenever your weapon is destroyed gain +1/+1. 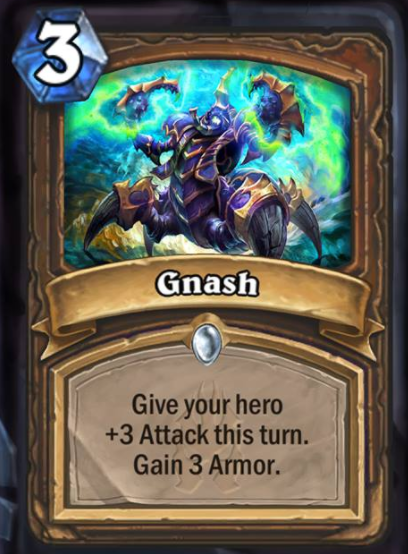 Gnash 3 Spell Give your hero +3 Attack this turn. Gain 3 Armor. 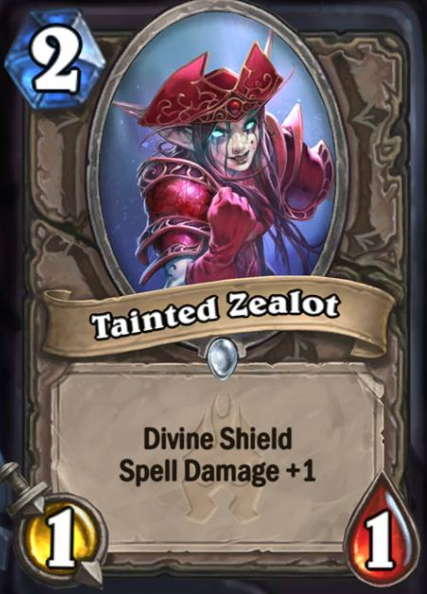 Tainted Zealot 2 1/1 Divine Shield. 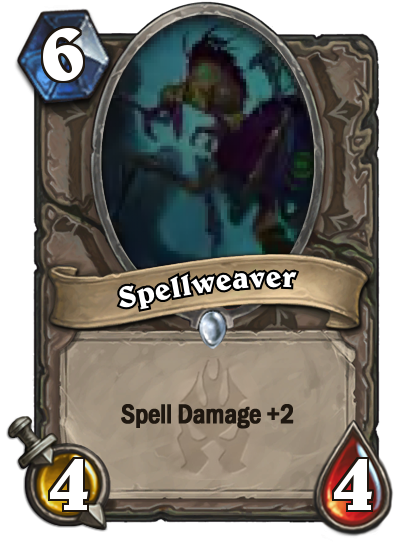 Spell Damage +1. 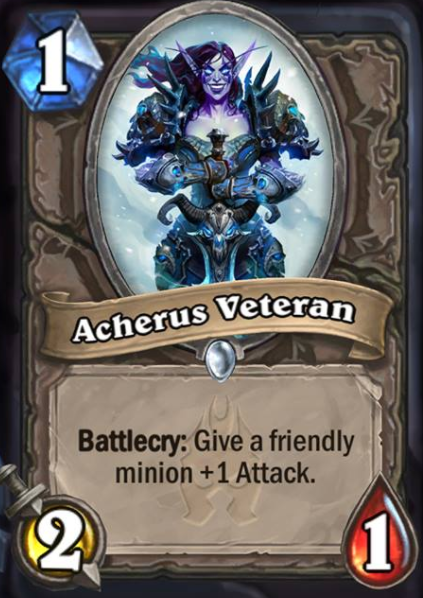 Archerus Veteran 1 2/1 Battlecry: Give a friendly minion +1 Attack.